The Jack Antonoff-produced album has arrived. Lorde has released her sophomore album, Melodrama. The Jack Antonoff-produced record comes four years after the singer's debut album Pure Heroine. Since announcing the album, the Kiwi singer has already released four songs ("Green Light," "Liability," "Perfect Places," and "Sober") and played at both Bonaroo and Coachella. 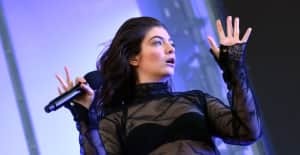 In an interview with the New York Times Magazine, Lorde revealed that the album tells the story of one night at a house party, and all emotions that come with it. “With a party, there’s that moment where a great song comes on and you’re ecstatic and then there’s that moment later on where you’re alone in the bathroom, looking in the mirror, you don’t think you look good, and you start feeling horrible," she said. Stream Melodrama on Apple Music.